To assess the feasibility of treating musculoskeletal pain in the lower back and/or lower extremities in persons with Parkinson’s disease (PD) with cranial electrotherapy stimulation (CES). Randomized, controlled, double-blind trial. Setting. Veterans Affairs Medical Center, Community. Nineteen persons with PD and pain in the lower back and/or lower extremities. Thirteen provided daily pain rating data. 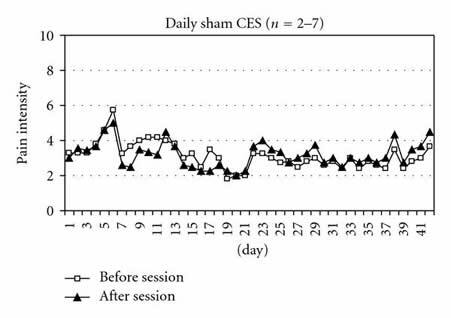 Of the thirteen participants who provided daily pain data, 6 were randomly provided with active CES devices and 7 with sham devices to use at home 40 minutes per day for six weeks. They recorded their pain ratings on a 0-to-10 scale immediately before and after each session. 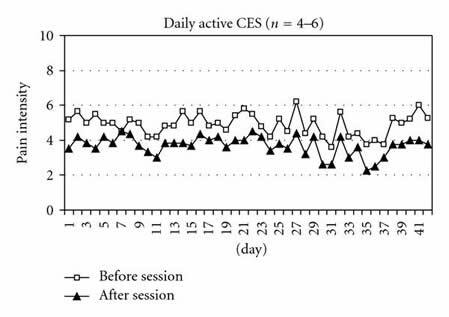 Average daily change in pain intensity. Persons receiving active CES had, on average, a 1.14-point decrease in pain compared with a 0.23-point decrease for those receiving sham CES (Wilcoxon Z=-2.20, P=.028). Use of CES at home by persons with PD is feasible and may be somewhat helpful in decreasing pain. A larger study is needed to determine the characteristics of persons who may experience meaningful pain reduction with CES. Guidelines for future studies are provided.